You can test drive a car before you buy it... so why not a community? 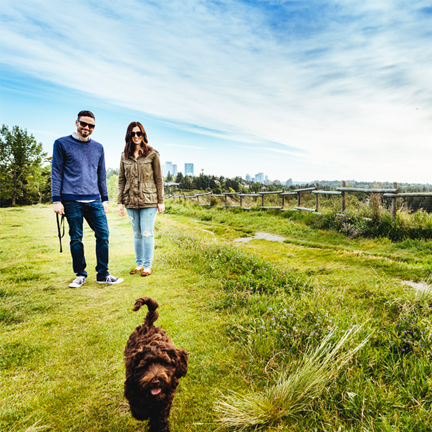 Join Jay from 97.7 Soft Rock FM and his wife Sharney as they explore all Brookfield Residential communities all over Calgary. Find out what your life would look like when you choose a Brookfield Residential community. MORE THAN MASTER PLANNED COMMUNITIES. For the past 60 years, Brookfield Residential has been changing the way you look at urban living, thanks to their master planned communities. What does that mean? It means creating communities where residents live healthier, more connected lives. Now living in a Brookfield Residential community means you’re in a place where you can work, play, and live. When you put away your work for the day, Auburn Bay is the place to play — especially if you love the outdoors. Pathways, parks, and public gathering spaces are designed to bring your family and friends together. From work to working out, dining to shopping, studying to a night at the movies, it’s all here. With its unique urban vision, Seton reflects the values of the people who choose to live, work and play, learn, settle and thrive in Seton. Livingston attracts and supports families seeking the opportunity to mix and mingle with those who value the fun and friendships that come from a healthy and vibrant community. Symons Gate provides a perfect marriage of natural beauty and timeless architecture. Its prairie-inspired look and feel is expressed in a fresh new way that you won’t see in any other northwest community. And with all kinds of amenities from schools to shopping, prairie fields to golf-course fairways, Symons Gate is close to everything you need. You can choose to live anywhere, but wouldn’t you want to move your family somewhere where the focus is about creating a sense of belonging? The perfect marriage of natural beauty and established amenities, there’s tranquility when you want it, and great access when you need it. From the pathways that wind through the rolling hills and the many places to work out or relax to shops and necessities, it’s all waiting for you in Riverstone.